Short subshrub with lovely, tiny blue-green leaves on upright stems with terminal clusters of pale pink blooms in spring. Perfect for rock gardens and front of the border. Care: sun in well-drained soil. Sheer back after blooming to keep compact and rebloom. Native: Lebanon and possibly Caucasus on chalky summits. Collected before 1841. 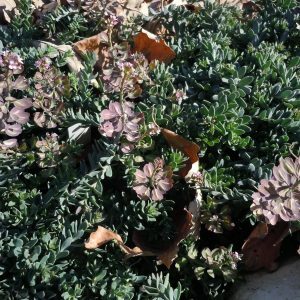 Foster: “…when planted in quantity does wonders for mass effect in the rock garden or alpine lawn.” January 1876 issue of The Garden called these “very attractive dwarf rock garden plants.” Aethionema from aitho meaning scorch and nema for filament. 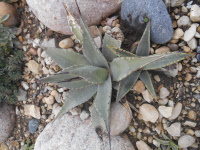 Care: full sun in well-drained soil. Drought tolerant. Wildlife Value: attracts honeybees & other pollinators, Deer & Rabbit resistant. Short-lived perennial, but self-seeds where happy. Described in 1849 by Pierre Edmond Boissier and Rudolph Friedrich Hohenacker.